Campaigns to raise public awareness have limitations, but they are also constantly being refined and improved. They must be regarded as a key first step on the road to more mature forms of engagement. I cringe at sloppy statistics and exaggerated portrayals of human trafficking. Victims presented as objects of pity, and audiences placed in a position of superiority where they are told they alone have the power to change a person’s life. Whether awareness campaigns using such devices are ‘worth it’ is a loaded question. Could campaigns that raise awareness about human trafficking be made more responsibly while remaining successful? I believe that they can. Do I believe that we should “do it right, or not at all?” No, I do not. I’m glad about what we have accomplished as a anti-trafficking movement, and I think we are continually learning. Since the issue of human trafficking moved into the spotlight two decades ago there have been significant improvements in our responses and solutions. We are increasingly seeing more traffickers arrested and prosecuted, more attention given to the TIP reports, more states with safe harbour legislation, more training amongst child welfare agencies & other service providers, more concern from the UN, and more businesses taking a look at their role. This simply couldn’t have happened without years of awareness campaigns. Despite their flaws, these campaigns have made an overall positive contribution to combating human trafficking. 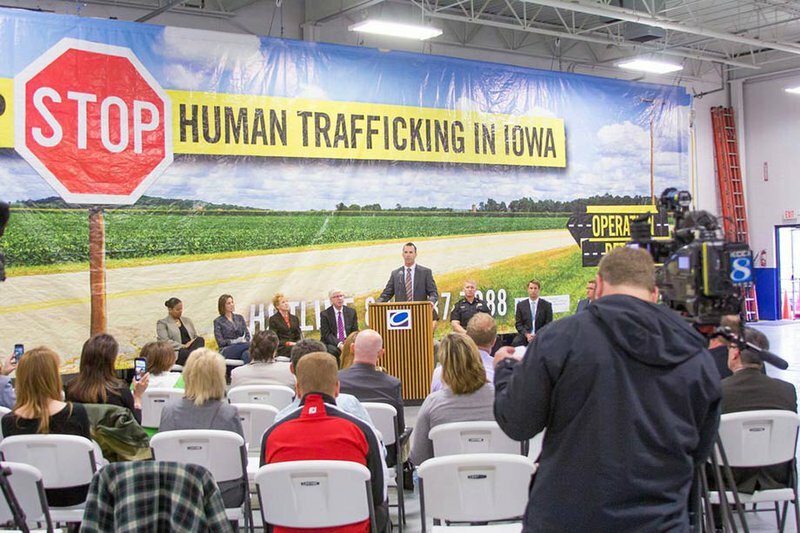 Supervisory Senior Resident Agent Robert DeWitt of the FBI Des Moines Resident Agency (Omaha Division) delivers remarks during a press conference unveiling an outdoor media campaign to combat human trafficking in Central Iowa in 2016. FBI Omahai/Flickr/Public Domain. Some critics of human trafficking awareness campaigns downplay the scale of the problems we face. 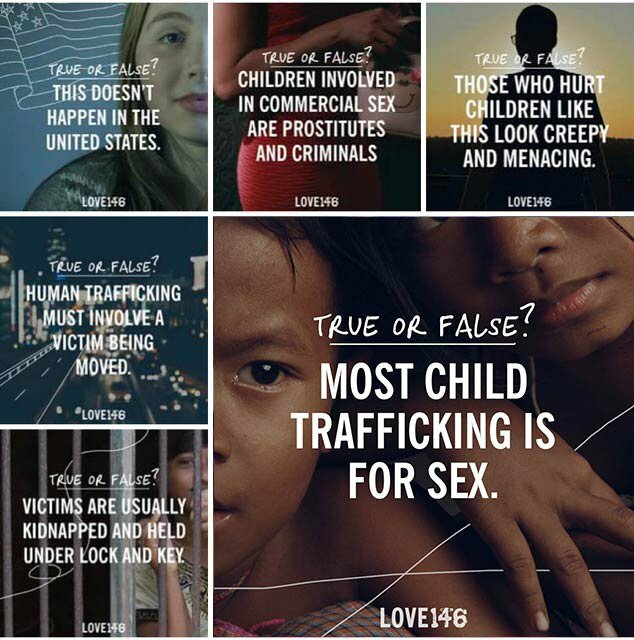 These charges are hard to reconcile with my nearly eight years of experience working at Love146, which have demonstrated to me that human trafficking and the sexual exploitation of children is a real and significant problem. In 2012, Love146 set up a feeding centre in the Philippines. Within 15 months we met over 30 children who had been sold to foreign paedophiles and used in cyberporn. Since 2014, we have provided services to 89 confirmed victims in Connecticut alone. Cases reported to the National Human Trafficking Hotline have increased by over 75% over the past five years. Contrary to a common misconception, this is not an indication of the problem getting bigger. Rather, it is a outcome of increasing public and service provider awareness among our communities, which is having a real impact for the lives of survivors, including children I have met. In my work, I primarily view public awareness campaigns as a ‘front door’. Their purpose is to motivate people to engage in a meaningful way and to cultivate a sense of conviction which encourages action. In order to engage with people’s emotions during this initial point of contact, we need to hold back complexities and nuance, and work in consideration of the false assumptions most of our audience may have about the world. Some of these false assumptions include the still popular notions that boys aren’t sexually abused, or that when someone uses drugs or makes bad choices, it’s their fault when something goes wrong. During the initial contact we need to hold back complexities and nuance and work in consideration of the false assumptions most of our audience may have about the world. A campaign won't likely be successful in challenging these assumptions when someone doesn’t even know human trafficking is a problem. Within the vehicle of mass marketing, it is wise to challenge one knowledge deficit at a time. With these limitations, an effective ‘front door” needs to focus on bringing someone to a better understanding of the bottom line of the problem: it is wrong when someone’s vulnerability is exploited for profit, and this issue is affecting too many people. We need that simple truth to be felt viscerally in order to compel people to act. Once that initial threshold has been reached, there are then opportunities to dig deeper into additional information and reveal further complexities and steps for action. The role of subconscious assumptions means that vulnerability may initially be easier for many people to grasp when victims are small, young, unhappy, being physically restrained, and female. Sadly, even racial biases can play a role in how we perceive vulnerability or our predisposition to feel empathy. Once people walk through the door, it is our responsibility to help them understand that trafficking and exploitation happens to people of all ages, all genders, all races, and all places – near and far. These may be harder truths to engage with, but when our audience starts with a clear conviction about the wrongness of the crime, there’s a better chance of appropriately comprehending the many forms that vulnerability and exploitation can take. Diverse and proportionate representation of the victims, perpetrators and scenarios of exploitation is important in our general communications about the issue beyond awareness campaigns, and is critical if the goal of a campaign is victim identification. A 2015 social media campaign for Human Trafficking Awareness Day addressing common myths. Love146/used with permission. Awareness-raising is often critiqued for being too shallow, but it needs to be understood in as one step in a longer journey. Take, for example, the CDC’s Public Health Model of Violence Prevention. This identifies four distinct steps, which usefully illuminates the path from early steps to mature engagement. Step one is awareness; a place allowing us to learn how to define the problem. Step two is examining factors that make the problem better or worse. Step three is testing solutions and strategies to address the problem. And step four is widespread adoption of strategies that work. My colleagues and I would suggest the broader anti-trafficking movement is currently entering stage three. Today’s grassroots campaigns need to catch up before creating new awareness campaigns, or they run the risk of making the same mistakes we’ve already learned from. Two decades ago, the modern-day anti-trafficking movement was in step one. Consequently, our awareness campaigns were created from a place of earliest maturity. They generally featured a more stereotypical narrative, and at their worst moments, contributed to myths and misconceptions. Today, with the insights gained in reaching step three, we’re able to create more thoughtful step one material for newcomers. Recent awareness campaigns can now be informed by a clear understanding of the problem, the risk factors, and pitfalls of certain solutions. There is nothing wrong with being new to the scene. We all were at some point. The key point is that today’s grassroots campaigns need to take the time to catch up before creating new awareness campaigns, or they run the risk of making the same mistakes we’ve already learned from. Theodore Roosevelt said that “it is not the critic who counts … the credit belongs to the man who is actually in the arena ... because there is no effort without error and shortcoming”. Mistakes, while natural, should not be excused, and it is on each of us engaged in this issue to be humble, admit mistakes, and learn together. It is also important to recognise that there have sometimes been compromises – like overblown stats and lurid imagery – which have taken away integrity from the movement. Some of these comprises can be regarded as growing pains which will hopefully fade away with the passage of time. However, there are also some compromises that have the potential to do real harm. Some of these include making victimisation sexually provocative, neglecting confidentiality, implying that slavery requires literal restraints or chains, and inflating a supporter’s sense of power in a way that comes at the expense of a victim’s dignity. Take, for example, slogans like “only you can save her”. I cannot deny that harm has been done by using these approaches, and that they detract from the progress that we have made. However, I do not believe those mistakes eliminate the overall contribution and path that has been paved.